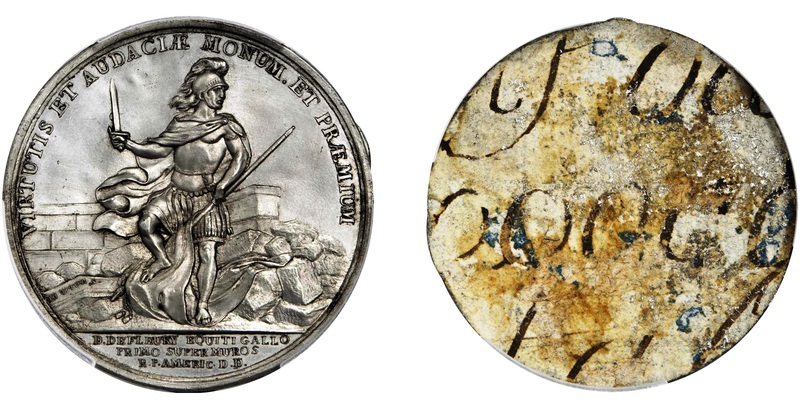 Lot 8: “1779” (1789) DeFleury at Stony Point Obverse Cliche. Tin, uniface, backed with paper. As Betts-566. MS-62. An impressive offering of Numismatic Americana in Session 1 was marked by noteworthy Mint Medals and Washingtonia. Strong bidding began early with the extremely rare tin cliché of the DeFleury medal from the Cardinal Collection in lot 8. As one of only two obverse cliché’s known (the other is the Ford example), this piece realized $10,800. A gorgeous MS-64 BN CAC example of the famous Libertas Americana medal in bronze in lot 19 sold for a strong $51,600. Lot 61 offered a lovely original 1853 Pierce Indian Peace medal in silver that brought $10,200. The selection of George Washington issues comprised nearly 70 lots of rare and desirable items. A gorgeous and possibly unique (ca. 1800) Resumed Command medal with a provenance to the Norweb Collection was featured in lot 84. Certified MS-62 and attributed as Musante GW-86, that piece brought $15,600. This price was exceeded shortly thereafter by the gorgeous Washington Inaugural Button in lot 131 that brought $16,800 as one of just three to five known of the variety. Lot 168: 1905 Women’s Auxiliary of the Massachusetts Civil Service Reform Association Presentation Medal. Bronze. 125.6 mm. by Frances Grimes and Augustus Saint-Gaudens. Marqusee-349, Storer-1321, Dryfhout-199. MS-64. The massive 125 mm. medal from the Women’s Auxiliary of the Massachusetts Civil Service Reform Association realized $11,400 in lot 168, certainly bolstered by its association with Augustus Saint-Gaudens. Lot 213 offered a Charleston, South Carolina Interstate and West-Indian Exposition Award Medal in rare gold format. Awarded to the Philadelphia firm of Henry Disston and Sons, this example sold for $15,600. An incredible new discovery was offered in lot 271, the only known HK-1000a Erie Canal Medal in silver. This unique piece exhibits a previously unknown reverse die now classified as Reverse A, and brought $26,400. Lot 10001: (1792) Washington Born Virginia Copper. Legend Reverse. Musante GW-33, Baker-60, W-10730. Rarity-6. Copper. MS-66+ BN. Secure Holder. CAC. Session 4 comprised the Rarities Night Auction, featuring the most magnificent treasures of the Baltimore event. The session had an impressive start with the Washington Born Virginia copper from the Cardinal Collection offered in lot 10001. Certified MS-66+ BN CAC and likely the finest known, it earned $114,000. Lot 10003 showcased the Mint State 1792 Silver Center cent that was the undeniable star of the evening. Also from the Cardinal Collection and with earlier provenance to the 1905 Chapman brothers’ sale of the Charles Morris Collection, this historic rarity realized $900,000. Additional highlights from the Cardinal cabinet included an incredible AU-58+ 1794 Flowing Hair half dollar that brought $252,000 (lot 10057) and the only Mint State 1797 BB-72 Draped Bust silver dollar that sold for $264,000 (lot 10075). Lot 10114: 1796 Capped Bust Right Quarter Eagle. No Stars on Obverse. BD-2. Rarity-4. AU-53. Secure Holder. The gold coins offered in the Rarities Night session included a parade of jewels from the Murray Hill Collection, beginning with a gorgeous AU-53 1796 No Stars quarter eagle in lot 10114 that earned $150,000. Immediately following was an incredible MS-63 * 1796 Stars on Obverse quarter eagle from the Murray Hill Collection previously from the collection of John Whitney Walter, which sold for $324,000 in lot 10115. A handsome Mint State 1808 Capped Bust Left quarter eagle was presented in lot 10116, and sold for $144,000. A Proof-66 Cameo 1879 Flowing Hair Stella from the Murray Hill cabinet was featured in lot 10118 and earned a top price of $240,000. The larger denominations of the Murray Hill Collection also saw aggressive bidding, with the Proof-63 Deep Cameo 1873 Liberty Head double eagle in lot 10126 bringing $105,000 and the Proof-65 Ultra Cameo 1889 Liberty Head double eagle in lot 10127 earning $90,000. Among other double eagles in the sale, the finest certified 1858-O double eagle appeared in lot 10206. Recovered from the S.S. Republic shipwreck and graded MS-63, that prooflike piece sold for $156,000. Lot 10214, a Proof-66+ * Ultra Cameo 1886 double eagle that is one of just 20 to 25 remaining, brought $228,000. The Proof-65 * Ultra Cameo 1889 double eagle in lot 10215 garnered an equally strong $156,000. Lot 4004: 1652 Pine Tree Shilling. Large Planchet. Noe-1, Salmon 1-A, W-690. Rarity-2. Pellets at Trunk. EF-35. Session 7 featured an expansive selection of Early American coinage, presented in cooperation with the Colonial Coin Collectors Club (C4). The offering of Massachusetts silver was highlighted by a Large Planchet 1652 Pine Tree shilling from the Noe-1 dies, which realized $14,400 in lot 4004. A gorgeous Choice EF Lord Baltimore sixpence sold for $18,000 in lot 4009, and the MS-63 BN 1788 Massachusetts cent in lot 4066 nearly doubled its price realized in the sale of the Donald Partrick Collection, bringing $15,600 in the Stack’s Bowers Galleries event. A highlight of the evening’s session was the offering of 61 exceptional duplicates from the Syd Martin Collection of New Jersey coppers, including the gorgeous AU-55+ 1787 Maris 48-g in lot 4171 that brought $4,560 and a lovely VF-30 1788 Maris 65-u in lot 4197 that sold for $7,800. A handsome VF-25 1786 Maris 19-M in lot 4139 from the LJV Philadelphia Collection sold for $11,400. A premium AU-55 Bar Copper also from the LJV Philadelphia cabinet brought $13,200 in lot 4219. The Washington pieces in the Early American session met with the same enthusiasm seen by the Washingtonia in Session 1. The exceptional MS-66 BN Liberty and Security penny from the Cardinal Collection in lot 4242 sold for $6,600, and an AU-55 Washington Funeral Urn medal in white metal brought $8,100 in lot 4251.